2019 MARKS THE 72nd ANNIVERSARY OF PARTITION! There is a great urgency to record stories now. Join us through this special program for the final years of story collection. Below, please find the application, instructions and program description for our story collection program, the Story Scholars Program, which is a full or part time commitment. **NOTICE FOR SINDHI LANGUAGE SPEAKERS: Please apply below for special Sindhi Language Scholarships being offered by sponsors in India (Bikhchandani Scholarship). Application Cycle Deadline EXTENDED: February 1st, 2019 at 11:59 pm IST - APPLICATIONS ARE NOW CLOSED! m) **NEW! Sindhi Language Scholarships in India (record stories in Sindhi) - Any city. Last date for applications: February 1ST, 2019 at 11:59pm IST - APPLICATIONS ARE NOW CLOSED! WHICH PROGRAM WOULD YOU LIKE TO CHOOSE? Commitment: Unlike the Story Scholars Program can be treated as a full time commitment over 3 months or as a part time commitment over 6 months. The 6 Month Track commitment track is for individuals who have other commitments such as students or professionals who are unable to place their career on hold for a full time commitment. The 3 Month Track requires full time commitment for the 3 months and is an ideal choice for summer holidays for college students. About the SSP: The 1947 Partition Archive provides a platform to record, preserve and share narratives of Partition created for and by people across the globe. We want to educate the world on Partition, especially through first hand accounts and lived experiences. The Story Scholars Program is one of our initiatives for the collection of oral histories from Partition witnesses. The Archive works to ignite research and discovery based on lived Partition experiences. The Story Scholars Program entails a 3-6 month period of focused story collection in the Scholars' selected geographical region. The Archive will provide training to the scholar. Equipment for borrowing from The Archive may be available to the Scholar, subject to availability. 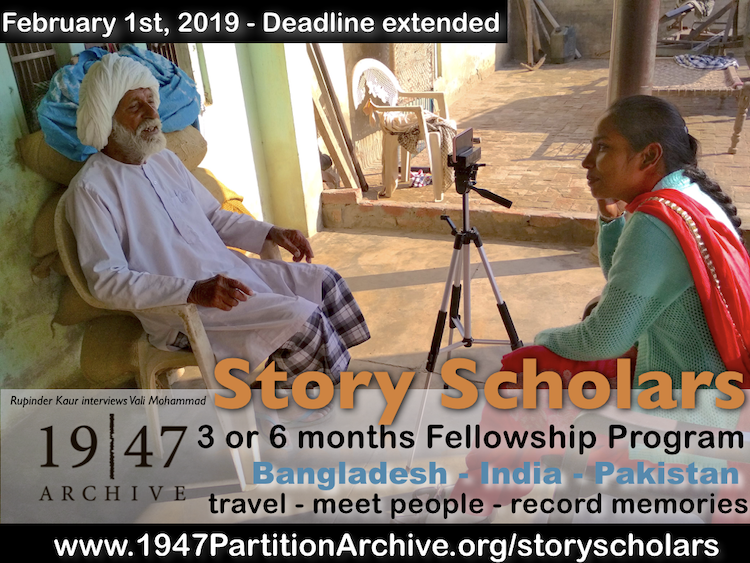 Scholars will reach out to individuals in their community who have witnessed Partition first hand (migrants and non-migrants), record their oral histories and share them through The Archive's web portal and media collaborations. Scholars will also be required to engage the public in developing storytelling skills through a publicly held Oral History Workshop. Scholars will remain in contact with the Program Coordinator on a bi-weekly basis. Scholars may collaborate with The Archive in publishing research based on stories in academic journals. The Archive may pair scholars with an academic mentor. Scholars will have opportunities to present their work in public and academic spaces, as well as community building and networking opportunities. Scholars will receive a modest stipend and a certificate upon successful completion of the program. Upon successful program completion, Scholars will be recognized as alumni into perpetuity and have access to further opportunites through The Archive, including the opportunity to apply for select staff positions, to represent the Archive publically and much more. Mandatory Retreat in Delhi: March 1st to 3rd, 2019 (This is deeply engaging and fun event. It is also an absolute requirement. All expenses will be paid for you). 6 Month Track: 3 months probationary period followed by three months of apprenticeship work. 3 Month Track: 1 month probationary period followed by two months of apprenticeship work. Maintain communications with interviewees; manage scheduling, answer questions, etc. Story Scholars - 6 Month Track: 60 Total Stories - Record 8 interviews/month for first 3 months and 12 interviews/month for next three months. Story Scholars - 3 Month Track: 60 Total Stories - Record 16 interviews/month for first month and 22 interviews/month for next two months. Story Scholars are highly motivated and enthusiastic individuals with a deep interest and passion for modern South Asian history and storytelling. Story Scholars are individuals who wish to participate in and devote themselves to expanding and broadening the understanding of modern South Asian history. The Story Scholarship program is ideal for individuals who have a passion for traveling, meeting new people and gaining a better understanding of the world and culture around them. Scholars are expected to develop ownership of their project, be flexible with their working hours, ready to work hard and devote their time in realizing the archive’s mission. The 1947 Partition Archive encourages its scholars to participate in public outreach programs and activities where they can further our mission to collect, document and preserve narratives. The 1947 Partition Archive Story Scholar will represent the organization at public lectures, schools and similar platforms in educating the public on Partition and collecting narratives. Scholars must have a strong passion for and dedication to our mission and goals. What Scholars can expect? Scholars will receive relevant training, fieldwork experience. All Scholars will be working under the guidance of a local mentor (distinguished scholar/ academic), and will work directly with the program coordinator. Story Scholars' work will be published and widely distributed through The Archive website and via other media collaborations. Currently enrolled college students or college graduates of any discipline. Masters students are preferred, but Bachelors students will be considered. Selection of the candidates will be a three tiered process. Note that INR and PKR distinguish the payable stipend amounts in Rupees for India and Pakistan respectively. Many thanks to the generocity of the Bikhchandani Family, we are offering a scholarship to Sindhi Language speakers in India who are able to record stories in Sindhi, a disappearing language in India which remains alive in Pakistan. Help preserve this endangered language while also preserving precious memories of Sindhi Partition refugees who migrated to India in 1947. The special compensation accounts for increased cost of living in the 8 major cities identified. Note that INR and PKR distinguish the payable stipend amounts in Rupees for India and Pakistan respectively. >>Last date for applications is: January 15th, 2019 - APPLICATIONS ARE NOW CLOSED!